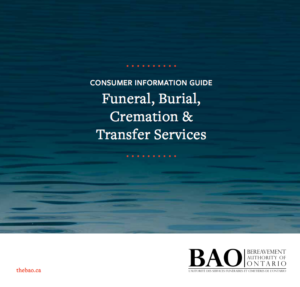 Grey Bruce Cremation and Burial Services Inc. is a transfer service licensed by the Bereavement Authority of Ontario. We are regulated by the Funeral, Burial and Cremation Services Act, 2002. This Act regulates funerals, burials, cremation and related services. We will not pressure you into adding services or encourage you to purchase items that you do not request. We strive to give you and your family the peace of mind you deserve. You can be rest assured knowing that every detail will be handled with the utmost professionalism. For your comfort, convenience or privacy we'll gladly come to your home to discuss at need and pre-need arrangements or you can meet with us in our office. Serving Grey, Bruce and surrounding areas since 2003.